The United States has many vacation spots to get away to. You could take your family to a nice beach or a fun theme park, but have you ever considered taking a trip to a Christian destination? This might sound a little strange at first, but there really are some amazing Christian places worth checking out if you have the time and resources. Here are 6 Christian places to check out in the United States! The Holy Land Experience is located in Orlando, Florida and it is an amazing site. When you visit there you will get a great lesson in history as the Bible comes alive. The park is built to look like Jerusalem 2000 years ago, including the buildings and other exhibits. There is even a replica of the tomb that Jesus was buried/resurrected in. You will visit the Great Temple, Qumran Dead Sea Caves, and the Wilderness Tabernacle to name a few. They have musicians perform there and also have Biblical archaeologists explain the importance of the exhibits there. You are sure to have a great time there! The Creation Museum is located in Petersburg, Kentucky. This building is massive at 70,000 square feet and it focuses on creation of course! You can walk through the Garden of Eden, enjoy the planetarium, immerse yourself in the botanical garden, enjoy the special effects theatre, or many other amazing exhibits. They have dinosaurs there and animatronic characters from the Bible that interact with you. There are a whole bunch of exhibits there! This is a must visit for anyone! I know that a cruise in itself is not a destination but it is something worth checking in to. Instead of mentioning one cruise, I am saying this one in the general sense. There are many amazing Christian cruises that are available all year long. They include anything from guest speakers and comedians to bands and worship groups. These are a great way to reconnect with your spouse or have fun with your friends or children. 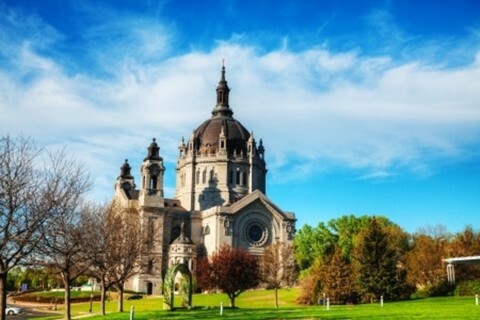 There are many Cathedrals of Saint Paul in the U.S.A. The one I’m referring to is located in Saint Paul, Minnesota. It is known as the fourth cathedral of Saint Paul. It is an absolutely beautiful building. I had the chance to visit it back in 2000 and I was blown away by all of the beautiful architecture that it displays. The outside alone should be enough to make you want to step inside. But when you enter you get a bombarded with an enchanting display of color from the gorgeous stained glass windows. The statues of the saints are remarkable and, of course, if you have a chance to sit through a mass then by all means do it! This is a must see if you are in the area of Saint Paul, MN! Cathedral of Saint Paul: A must see if you are in the area of Saint Paul, MN! Hume Lake hosts many different camps, but I want to focus on the marriage retreats and honestly it would be a great place to visit if you get a chance. This destination will get you focused on God and your spouse for a romantic getaway from life into the great outdoors. There are tons of activities to do there and there is plenty of relaxing things to do as well. The goal is to get reconnected intimately with God and your spouse! This will happen through a variety of methods including worship, guest speakers and time alone with each other. This beautiful park is located in Tennessee and it is one of the most visited state parks in the United States. I picked this one because if you go to it with the mindset of taking in God’s beautiful creation you will not be disappointed. With over 26,000 acres to hike and enjoy you can get some serious one on one time with God and enjoy all of the beauty of nature around you. The trees in autumn are absolutely breath-taking! This is a must visit for nature lovers! These are only 6 of many different types of Christian destinations in the US. Get creative and think of some places you would want to visit. Maybe check out a Christian recording studio. They may have tours there. Or see if you can visit a Christian radio station, like K-Love. The possibilities are endless and so is the adventure! May God bless you as you continue to live a life worthy of the calling! Take a look at this other article also by Derek: If God is For Us Who can be Against Us? I’m planning on visiting The Holy Land Experience this summer. And thanks for letting me know about the Christian Cruises. I had never heard of it before. Please what is the cost of accommodation in Petersburg Kentucky? Please let me know as I want to Visit there . We do not know this for the Petersburg, Kentucky area. There is most often a chamber of commerce website for each city, so perhaps it is there.